I touched him! I actually touched him! Tuesday was an extremely hot day in the valley and I spent several hours hand-watering my flowers. As usual, I accidentally left a garden hose running on a newly planted tree. How often do you leave one running? I remembered the hose after dark and took a flashlight with me to the pond area where the faucet is located. There sat George, on the edge of the pond. I kept the light on him and walked closer and closer. He calmly stayed put, not blinking like the deer in the headlight syndrome. I walked slowly, pointing the beam at George. How close can I get? Standing one foot away, I paused. Can I touch him? Holding the light in one hand, I leaned over, extended my other hand, and touched him with my finger. How exciting is that? The startled bull frog jumped back into the pond with a big splash. Impressed with my accomplishment, I hurried back to the house to brag. Husband's advice: “You should wash your hand so you don't get a wart.” Good idea! I have enough old-age barnacles on this body. I missed a perfect opportunity for a great picture. I wish you were here to see his beautiful glassy eyes staring back at me. How did the princess became brave enough to kiss her frog? Time for research. According to one version of the fable, The Frog Prince, the princess kissed the frog because he cried and wanted a friend. Husband's thoughts: “I'm glad you didn't kiss George the frog because you already have your prince.” Husband spoke the truth! Thanks again for joining me in the library. I appreciate your friendship. emails are welcome or post comment below. Washing windows became exciting this week. “Why?” you ask. I put the dreadful project off for a year or two or three (confession time) until my friend, Barbara gave me a demo using Microfiber cleaning rags from Walmart. Does this sound like a commercial? Don't laugh until you try this funny-feeling material. One wet (not soap needed) for cleaning the window and a dry one for drying. No drips, no squeegee, no streaks. Now I am sounding like a commercial. Six for five dollars. Available in blue and white. Of course, you must dry with the white one. Are you smiling? Another exciting thing happened this week. I can now read the huge round clock in my library from across the room without my glasses. I thought just “old” people had cataract surgery, so I must belong in that group now. This reminds me when Jesus healed two blind men in the book of Matthew. They shared their excitement with everyone they saw. Life is full of excitement if we open our eyes and look around us. Family and friends are more valuable than 'things'. The month of August has been plum full of relatives visiting and many friends gathering for celebrations and the month is not over yet. A bouquet from my garden to you. This week's brief letter to you is my way of saying I appreciate all of you and thanks for the many cups of tea and coffee we shared together in my library. Determine to keep your life exciting. You are welcome to post a comment below or send an email. Yellow sunflowers are visible from my library window all year long. In the spring, I plant seeds next to our neighbor's 70-foot barn wall which makes a great privacy fence. He doesn't know it, but I fully decorated his wall. I discovered much treasure ignored and stored in our own barn such as: rusty old tools, old-fashioned car chains, stiff worn-out logging boots, out-dated car license that was never returned to the DMV. The list goes on and on. Now they're artistically arranged, with my cousin Roberta's assistance, on Steve's barn wall. I was telling you about my sunflowers, ranging from ten to two feet tall. I prefer shorter ones because they don't fall over like tall ones. Several are bright gold, some pale yellow and the cute ones are deep red. The stately flowers inspired me to paint a picture on our pump house one summer. The small building on the hill was already painted light blue, so the sky was completed before I started. 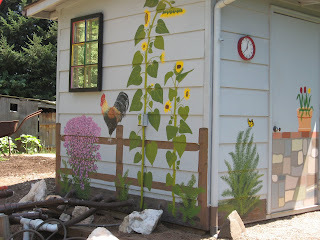 My painted sunflowers look life-size and give me pleasure long before seeds begin to grow in the spring and long after the real ones are dead. I enjoy sunflowers all year long thanks to God's gift of flower seeds and my elementary art work. You may comment by email or click on pencil below. Our bull frog is calling again. I must give him a name. Maybe I’ll call him George. Sounds as if George has a sore throat today. I'm glad he's not skittish because I like to sneak up on him and take his picture while he's floating among lily pads in the fish pond. So far, you have met George the frog, Charlie the squirrel, and Daisy our dog. I remember visiting Bird Haven in Stayton years ago. Mr. Koch names his favorite birds, but don't all barn swallows look alike? We bought two of his red bird houses and it's fun watching birds come and go and sit on their roof as if they belong there. They made themselves right at home the first week. Ready for inspiration? Last week, my friend Barbara returned from visiting the Billy Graham Library. His wife Ruth is buried there and guess what her tombstone reads. “End of construction. Thank you for your patience.” Now, doesn't that say it all? I'm sure Billy's epitaph will have a strong message also. In the hallway hangs my button board filled with old souvenir badges from many occasions, “Robertson for President” to “It's a Boy”. Thinking of Ruth Graham's words, reminds me of one particular button: P B P G I N F W M Y, which stands for Please Be Patient, God Is Not Finished With Me Yet. To leave a comment, click on the pencil below or use email.